If you need a nice ride in the beautiful city Huangshan, just simply contact us now to get our BEST QUOTES and GREATEST SERVICES today! Car rental serivice provider in Huangshan city China ! We drive your way in Huangshan! Huangshan,literally also Yellow Moutain, located in Anhui province, eastern part of China , It is bordered by Chizhou to the northwest, Xuancheng to the northeast, Jiangxi Province to the southwest and Zhejiang Province to the southeast. and is the largest city in Anhui Province. It is famous for its marvelous and beautiful scenery, the city got its name from the famous scenic Yellow Mountains which was enlisted as a World Heritage Site by UNESCO in 1990. 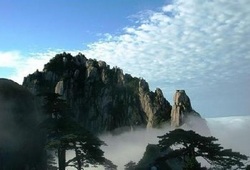 Huangshan is comprised of four urban districts and four counties. The urban center of Huangshan was originally the city of Tunxi, and is now called Tunxi District. Locals still call the city Tunxi to distinguish it from other parts of Huangshan. Huangshan's history can be dated back to the time of the First Emperor, much of its historical and cultural sites are in Huizhou (徽州) region, which together with Anqing formed the name of Anhui Province. Huangshan is home to two UNESCOWorld Heritage Sites, Mount Huangshan and Hongcun and Xidi, the ancient villages of southern Anhui, which make Huangshan city a famous and one of the most popular tourist destinations in China. Keemun tea is produced in Qimen County, and the tea is named after the county. Mao feng, another famous green tea in China, is also produced in neighboring counties.Tourism plays an important role in Huangshan Economy. Shanghai Car Rental Service will be very honored to have the opportunity to serve you in Huangshan city with our great limousine services, we will insure a hassle-free, most comfortable trip no matter you are traveling Huangshan city for official business visits or personal tourists. All our drivers are from local and they are all licensed, well trained and with more than 6 years’ experience in serving our foreign customers, they are also quite familiar with the routes in Huangshan and other cities in Anhui province ,can easily drive you wherever you want. ◆Huangshan City airport transfer services ,hotel pick up and drop off . ◆ Huangshan City railway /bus station/ transfer services . ◆ Huangshan Daily Limousine or car rental services (chauffer services) for short term period, include Huangshan Business tours or factory visits to neighborhood cities in Hefei,Huaihua,An'qing and other cities in Anhui province . City tour sedan /mini van/mini bus/coach services for individual or group travelers to the famous Yellow Moutain, Hongcun, Dixi , Wuyuan in Jiangxi province etc. ●Over 6 years experience in serving foreign customers, all our drivers are professional and over 10 years safe driving experience which guarantee our customers a safe ride.